Twitter is an online social media site. It’s a place to share information. It’s a way to find information. Twitter is a place to ‘meet’ and connect with people of similar interests and potential clients. It’s a way to ‘listen’ and ask what people think. And best of all, it’s FREE! A Tweet is a message typed and sent out on Twitter. Tweets are seen by everyone who is following you. Tweets can only be 140 characters, and should be shorter for easy ReTweeting. Tweets can be about anything you find interesting or informational. Followers are people on Twitter who see your Tweets, they have chosen to follow you. A list of your followers is on your profile. It is usually a good practice to follow people who follow you. Following someone on Twitter allows you to see their Tweets and Direct Message them. A list of who you are following is on your profile. A Direct Message is a Tweet that is only seen by the recipient. Someone has to be following you in order to Direct Message them. Direct messages are a great way to ask someone a specific question or personally thank them for following you. A ReTweet, is when you forward someone else’s Tweet to all of your followers. 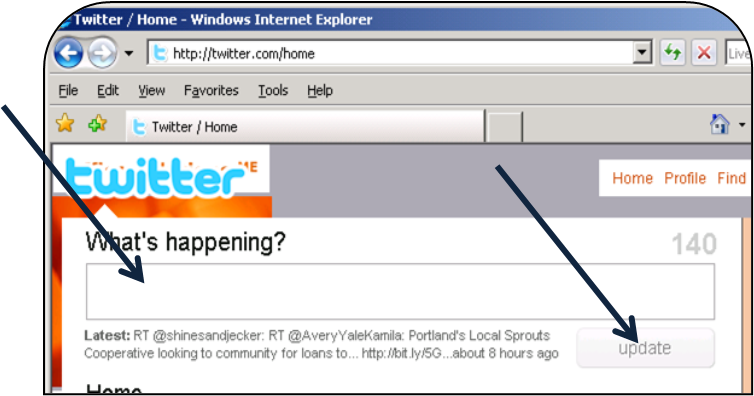 A ReTweet contains RT and original senders name (or handle) shown with an ‘@’ symbol (i.e. RT @OfficeSME). This is a great way to increase the number of people that see your Tweets. 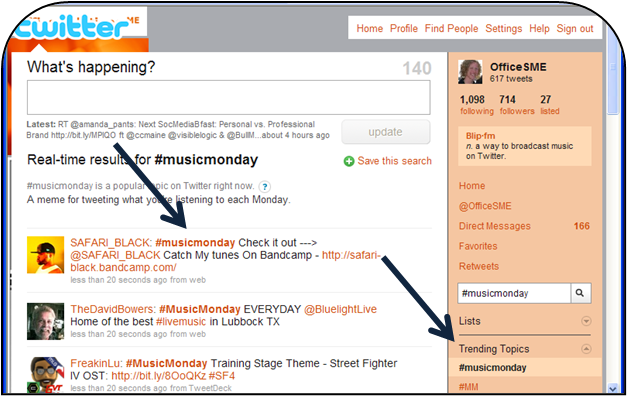 This is also a great way to share information that you find interesting with your followers. Hash tags help to organize Tweets of similar content. Hash Tags are shown as a number (#) sign followed by the topic (i.e. #Maine, #Cars, etc.). Hash Tags are helpful in getting Tweets to appear in search results. 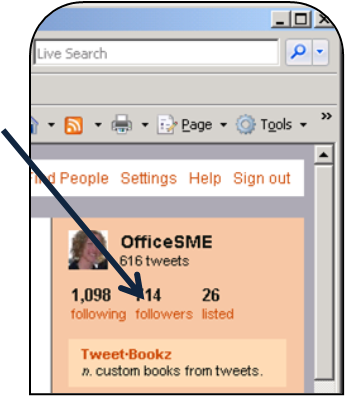 There are many different 2nd party sites that allow users to Tweet and organize Tweets and followers. Tweets include a ‘from’ line at the end, this indicates the platform used (i.e. web, Tweetdeck, etc.). Each site has its own advantages and disadvantages. You can organize who you are following into categories called lists. You can set up custom categories to organize your following. People that are following you can add you to a list that they have created. People can see the lists that you are added to. People can follow entire lists. Because Tweets are limited to 140 characters, symbols and abbreviations are important. 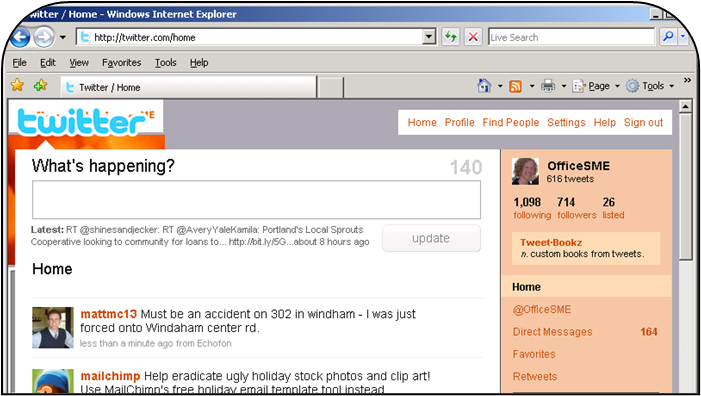 Get started on Twitter, www.Twitter.com. 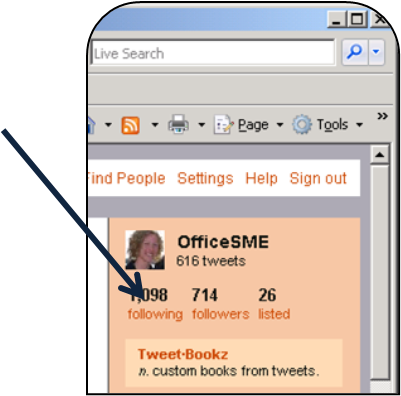 Follow me on Twitter by going to http://www.Twitter.com/OfficeSME or search for @OfficeSME. Need a personal tutorial and/or help with set-up?